Looking for a condo where live like a home? We present to you verdon parc by dmci homes. A resort-type condo where you can "feels goodto be home"
For Sale Newly Renovated house and lot at Gated subdivision in Baliok Talomo. 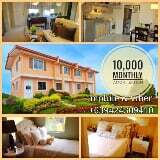 Lot area 110 sqm. 2 Br, 1 cr & 2 car garage. 1.9M fixed price net.